Have you moved to a new state? If so, it’s time to review your existing estate planning documents. The laws that govern estates, trusts, and property ownership can vary widely from state to state, so it’s prudent to have an attorney in your new state examine your documents and update them, if necessary, to comport with state law. Have you changed banks? If you are a person who prefers to bank with smaller, local banks, even an in-state move might require you to change financial institutions. If so, remember to pay attention to your titling. If accounts are to be jointly-owned, check with your new institution to find out whether, at the death of the first joint owner, the surviving joint owner automatically owns the account. If you have a revocable trust, it may make sense (depending on the specifics of your plan) to title checking, savings, and investment accounts in the name of your trust. Some institutions will also allow you to place a transfer on death or “TOD” designation on your accounts. Titling accounts intentionally, rather than allowing the bank’s “default settings” to determine titling, is key to maintaining a working estate plan. Are you buying a new house? Again, if your previous residence was titled in the name of your revocable trust, remember to title your new one in the same way. Married individuals may prefer to title their residence jointly with a right of survivorship or in some states (like Virginia), as “tenants by the entirety.” If you have questions about the best way to title your real estate, contact an estate planning attorney in your state. Do your fiduciaries still make sense? After spouses, we often see clients name family members or friends as fiduciaries based on their geographic proximity. If you’re moving, do these choices still make sense? Take a look at your documents (don’t forget to check who you’ve named as guardian for your minor children, if any) and, if an update is needed, start brainstorming about who to name instead. Are you moving to take a new job? If so, you will probably be filling out plenty of paperwork in the first few days, but don’t forget to pay special attention to your beneficiary designations on any new benefits that come with the job. People sometimes fill in these forms without giving much thought to their choices, thinking that they will update their beneficiaries later, when they have more time to devote to the task. If you do not take the time to name beneficiaries carefully, or forget to revisit these forms later, you may have an asset that does not pass in synch with the rest of your estate plan. Where are you keeping your estate planning documents? Make sure you tell your fiduciaries (and, if you remember, your estate planning firm) where you will be storing your estate planning documents in your new location, in case the need arises for them to gain access. documents, call us and we’ll be happy to point you in the right direction! 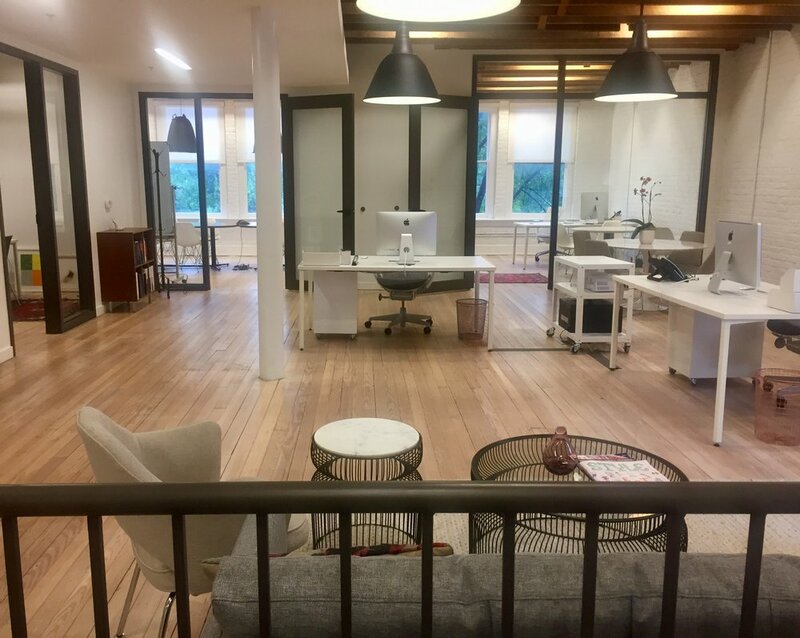 A month after we “packed up our bags" like the Clampetts, and “moved on up” like the Jeffersons, we are ecstatic to be installed in our new office! Nestled squarely in the heart of the “arts district” of Richmond, we feel right at home where creativity, and a touch of scrappiness, co-exist. A client asked us, “So, why did you move here?” Let me tell you why. Our neighbors. 1708 Gallery, a non-profit art gallery right next door shows cutting-edge work. Black Iris lays down tracks of original music composition for advertising agencies nationwide. Ledbury, just downstairs, creates and produces fine mens clothing with a bit of Southern flair, and Quirk Hotel, recently voted one of the top hotels for creatives by Tablet Hotels (and top ten in the South by Southern Living), is just down a block. And if that isn’t reason enough, after lunch we can walk next door to Charm School to get a cone of ice cream. As a law firm, we look for creative and custom solutions for legal needs. We can’t think of a better place for us, and better people for us to be around, to be able to do just that! Please stop by for a visit, and let us show you what’s in our backyard.